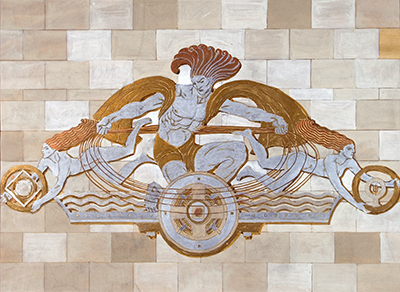 Some of Meière’s best known works are in New York City and include the Dance, Drama, and Song roundels that grace the limestone façade of Radio City Music Hall, the arch and ark mosaics in the Temple Emanu-El, and the red and orange glass mosaics in the Banking Room at One Wall Street. A versatile artist whose commissions were executed in glass and marble mosaic, tile, terra cotta, tapestry, leather, wood and metal, Meière understood that her success was in large part due to the positive collaboration she forged with corporate clients, architects, and the talented craftsmen who executed her works. Hildreth Meière: The Art of Commerce highlights corporate commissions in New York, New Jersey, and Connecticut and includes paintings, wall sculptures, preparatory drawings, cartoons and gouache sketches, as well as photographs of finished commissions. Also included in this exhibition are the full-size cartoons for the mosaic in the lobby of the Travelers Insurance Company in Hartford, CT.